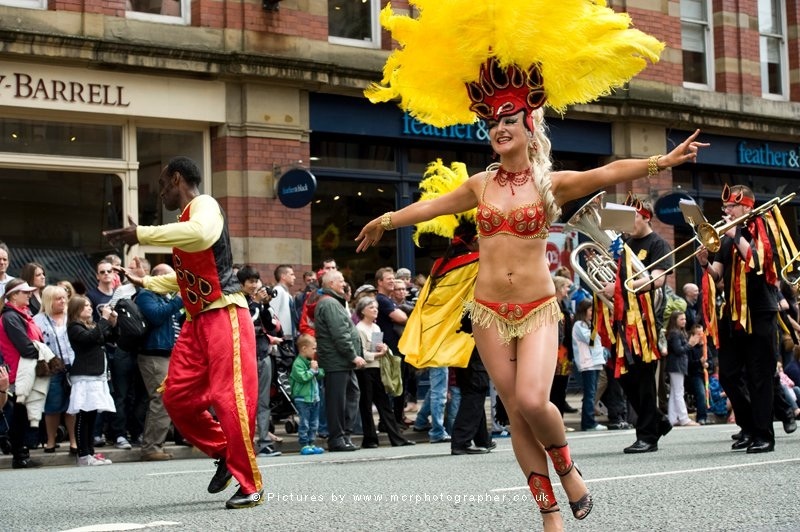 Welcome to Manchester School of Samba. After you read this, you should hop over there to find out a bit more about us. of Brazilian Carnival culture through rhythm, melody, dance and simple costumes. for special occasions also like to recruit a brass section and puppeteers. We focus on Brazilian Carnival Art forms, and teach rhythms & dances from different parts of Brazil at all levels from beginners to advanced and are open to all people. Periodically from late February/March and only during term time we will present A Beginner’s Class open to everyone. Every Wednesday we meet at Sacred Trinity Church on the junction of Chapel St and Blackfriars Rd, very close to Manchester City Centre, for a very sociable rehearsal from 7.00 till 9.30p.m. With over a decade’s experience of providing crowd stopping shows, inspirational workshops and courses for schools and colleges, and motivational team building for a range of corporate clients if you are organising a function or event or perhaps want your workforce to enjoy an activity and be brought together as a team, we are sure MSS can help so drop us a line! I have nominated you for the Very Inspiring Blogger Award. You inspire me and I want you to know it. I want to thank you, too for your support of my work. Now, to keep the love going, your task is to write a post sharing your nomination and who nominated you, plus 7 things about yourself and a list of 15 blogs that inspire you. Then don’t forget to tell those blogs that you nominated them (like I am doing now). Keep up your amazing work. Thank you for your reblog. Your blog is also very interesting! Thank you for your reblog. I am new to this blogging, not very technical and so still feeling my way a bit-thank you for being my first! Thanks so much for your reblog – my first. I am new to blogging – just learning how this corner of the world works. Thanks, again! Hi, you followed my blog and i’d like thank you. Are you brazilian? Nope but I teach people how to make carnival Brazilian style! Muito obrigado por visitar o meu Blog! Boa sorte com o Samba! Just a note to say thanks for the re-blog of my post RAIN, much appreciated. 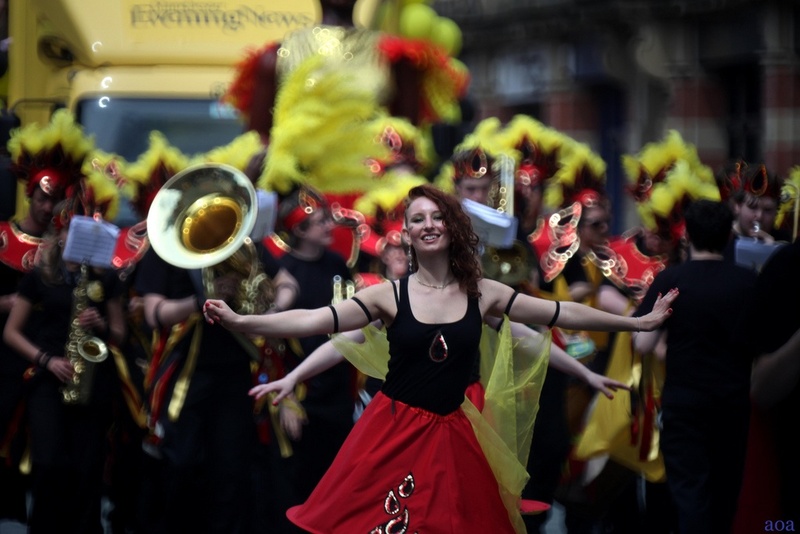 When is the next Manchester Samba Parade? sounds like an ideal photo opportunity. The next major parade we do will be The Manchester Day Parade on June 22nd 2014! Cheers, I will try and make it down, sounds like an intriguing event. Thank you for reblogging “My Trip to San Francisco” and for following imaginenewdesigns. Nice photos on this page! 🙂 The costumes and the bird are wonderfully colorful and interesting. Thanks for the reblog of one of my theatre posts on I do wander everywhere. Thanks for the England’s Christmas Markets reblog! I hope you visit again! Thanks for the reblog. Cheers. Yes and a fine Samba School in Pappagio! You have a great blog! Look forward to reading many of your posts:) Thanks for stopping by mine and the follow! Thank you for the reblog, your blog is wonderful and full of inspiring things so I’m glad you also liked my blog 😀 Looking forward to your future posts! Very cool site! Will be following you. Peace. Thanks for reblogging our articles. And thanks for following us. We appreciate it. We followed you back and look forward to seeing your articles in our reader. You have some really interesting artistic articles on your blog. I am looking forward to the next one! Nice to see you on here. Looks like you’re a pretty seasoned blogger. Still trying to get my head around WordPress (Tumblr is so much easier! ), but persisting with it. I hope you’re well. I wasn’t sure it was really you when I spotted the “Like”, so I checked out your blog (it’s very good by the way). I’d say what I do on here is mostly blogging by curation with a smattering of self originated pieces, since I’m not much of a writer. Thank Tony. I don’t use this much but I do like writing. I should do more really. There are many music, yoga and generally life-related stories yet to be committed to the page. I love tumblr but it took a while to get into it. For every amazing blog, there must be 99 crappy ones. I like that it’s not censored except that if you post nsfw content, you have to declare it in your settings meaning that your visibility drops drastically. Oh yeah, I’m already following you!